In December of 1998, I saw a posting on the rec.autos.makers.vw.aircooled newsgroup from a gentleman in North Carolina that had a bunch of Type 3 parts for sale. 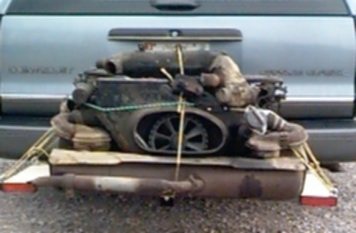 I contacted him, and arranged to get a complete engine for my Notchback. It sounded like just what I needed - dual-port cylinder heads, dual Solex carbs and a 12-volt generator. The only problem is that I live in Maryland, about 6 hours North of where the engine was. Luckily, he was willing to hang onto the engine until I had a chance to go down and pick it up. I was going to be in Atlanta, Georgia visiting family in early April, so we planned on meeting then. Since I would be traveling with the entire family, there was not going to be room inside the car for a greasy old engine. 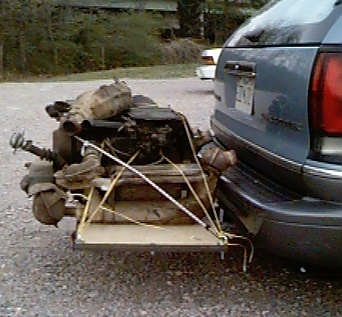 So I installed a class-III receiver style trailer hitch on the family station wagon and made a simple platform for the engine to sit on behind the rear bumper. The engine fit just fine, but it lowered the rear of the wagon so far that the platform was less than 6" off the ground! The drive home was happily uneventful, with trailer hitch only scraping the ground once in a while. The next step is to assess the engine and find out if it will actually run. The seller had no idea of the condition of the engine or any history of it.The only thing that I have done so far is to verify it turns over by hand. I should be able to get a better idea of the condition in a few weeks, when I have some spare time. Stop back soon and look for even more progress!